Home to many iconic buildings from Russia's extremely colourful past, Moscow is deservedly the Russian capital and is a true centre for both politics and economy. Embodying everything Russian, Moscow is filled with sights so big, bright and colourful that they are hard to imagine. Dominating much of Red Square (Krasnaia Ploshchad), tall red-brick towers of the Kremlin building are one sight hard to miss and occupy the actual spot where the city was first established. As well as its rich Soviet history, modern-day Moscow exudes a strong and at times even bohemian flavour, with some of the best art galleries that the world has to offer, which are also amongst the cheapest. Moscow does not actually contain any tourist information centres as such. Therefore, if you are looking for tourism advice within the city, you will need to turn to one of the many travel agencies, such as those located along the Komsomolsky Prospekt and the Zelenodolskaya Ulitsa, where a number of booking services are offered. The Moscow metro system is an enormous network of underground trains and allows tourists to zoom around and sightsee with ease. Lots of these attractions are highly suitable for children, such as the Big Moscow City, the modern Cinema Centre and the Zoo Park, where no less than 6,000 exotic animals call it their home. Also of interest is the rather surprising Moscow Dolphinarium (Dolfinariia), which is located within the rather grand surrounding of the Palace of Water Sports, built for the city's 1980 Olympics. 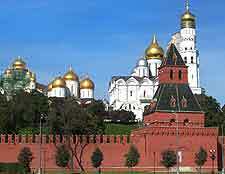 More information about Moscow Tourist Attractions. Many of the most noteworthy landmarks and buildings within Moscow emanate from around Red Square and give the city its strong identity and Russian character. The Kremlin is one such building and this vast complex comprises a group of cathedrals and palaces, along with a superb exhibition of weapons and jewels at the Kremlin Armoury, while Lenin's Mausoleum is close by and always attracts large crowds. Also standing proudly on Red Square is another of Moscow's iconic buildings, St. Basil's Cathedral. The brightly coloured, crazy architecture really is a sight to behold on a sunny day. More information about Moscow Landmarks. 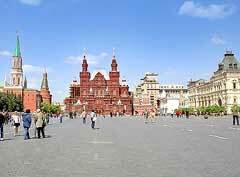 The Red Square is where you will find the exceptional State History Museum, which is located on the northern side and boasts a wealth of exhibits and information about the Russian Empire. Also worth finding is the Moscow City History Museum, which covers all aspects of the city's evolution from the Middle Ages onwards and is close to the historic Lubyanka Prison. A visit to the Pushkin Fine Arts Museum should be on everyone's itinerary and this is Moscow's premier international art gallery. The Modern Art Museum is also extremely impressive and features many stylish post-modernist pieces. There are literally dozens and dozens of further museums worth viewing, if you have the time and inclination. 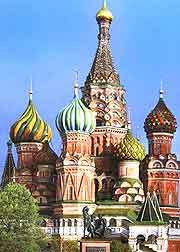 More information about Moscow Museums and Moscow Art Galleries. Russia is a vast country, although plenty of worthwhile day trips present themselves to tourists staying in Moscow. Close by is the village of Borodino, known for its tragic Napoleonic battle of 1812. Many pilgrims choose to visit the New Jerusalem Monastery within the town of Istra. Others prefer to visit the Tchaikovsky House Museum in neighbouring Klin, where this world-famous composer spent much time writing his classical music. More information about Moscow Attractions Nearby.